I used to frequent 2 yoga studios on Connecticut Street in North East Greenhills and within the same building, there was a small place being built called Om Lifestyle + Cafe. I thought to myself, with a name like “OM” it’s a strategic location for a shop that would probably sell yoga clothes and serve smoothies. I was so quick to judge a shop that wasn’t yet completed. When I saw a few photos of people from the neighborhood eating some Indian fare at Om, I invited Anonymous Paul to lunch and finally gave it a try. 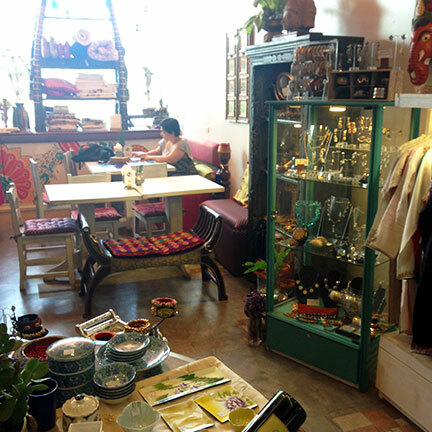 Om is a pretty shop selling clothes, home decor and accessories handpicked by the owners from India. I was quickly drawn by the smells of spices in the dining space and glanced at the menu. It’s a small menu, so AP and I ordered most of the items they offered. We started off with Pakora: some crisp potato, paneer and onion fritters with a side of tamarind sauce. We also shared a Samosa, a triangular pastry stuffed with fluffy potatoes, peas and spices. Both were crispy and not oily at all. The server gave us some chili chutney to add some heat to our starters. The mains followed halfway through our starters: the Butter Chicken, Mutton Rogan Josh, Paneer Tikka, Daal, and Cumin Basmati rice. We thought that maybe we had ordered too much even for 2 hungry people but the portions were just enough to share and get to try them all. The chicken, mutton, and daal were surprisingly light in taste and did not overpower each other on a plate. That doesn’t mean they were lacking in spice. In fact, AP pointed out that the dishes and even the cumin rice used a lot of whole, fresh spices in their dishes. 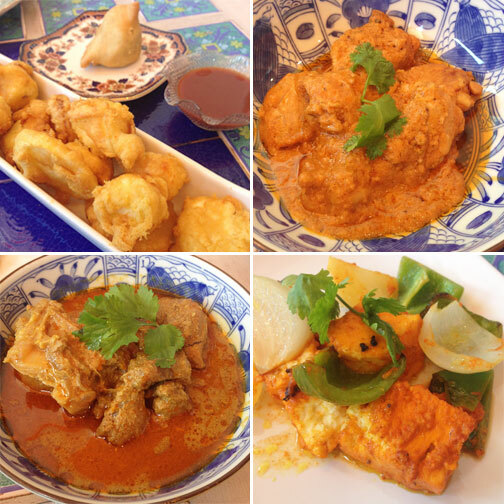 Perhaps the use of fresh ingredients is the key to the light and clean flavors in Indian cooking. I felt that the portion of the cumin rice was just good enough for one person, but that could also be my big appetite complaining. The mutton could be a little bit more tender, and I caught a few bones in a couple of bites. 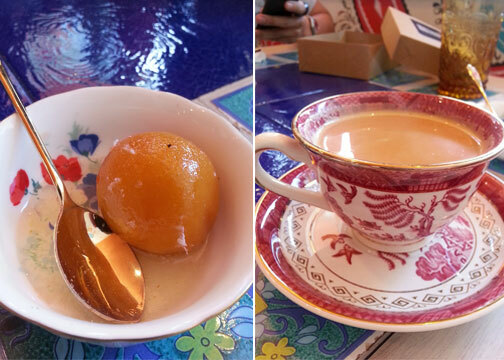 We capped off the meal with some Chai Masala tea and a Gulab Jamun. The Gulab Jamun is a densely packed milky dough ball, soaked in honey saffron. Overall, I would say that it was a good meal. We spoke briefly with one of the owners, Anjie Gogna, and learned that they use their Indian family recipes and prepare everything fresh, daily. It’s great to witness Greenhills progressively diversifying its tastes. I’ll keep in mind not to judge a place too quickly, I nearly missed a chance to try something different.